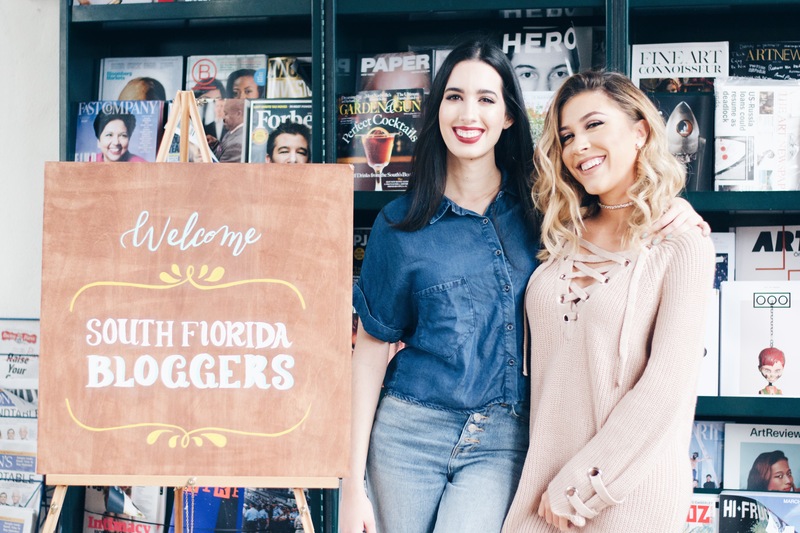 On Saturday January 21st, The South Florida Bloggers got together for the first meet up of 2017 at the Coral Gables’ Books & Books store. The guest speakers, Gaby Aleixandre and Vicky Alvarez, are established YouTubers who arrived eager to share their tips and tricks on how to start a YouTube Channel. The girls started by sharing a little about their background and how they got started on the platform. They even shared the cute story of how YouTube brought them together and their friendship blossomed. Gaby mentioned that she started recording her videos with an iPad and that investing in light boxes is not necessary at the beginning. Natural light can do the trick. However, Vicky mentioned that she is a night owl and that she records her videos late late at night. The crowd listened carefully and several were taking notes on everything the YouTubers recommended. Lightning is important: if you don’t have extra bucks to spare some light boxes and bring light, try to take advantage of the natural day light. Setting up your camera by a window and making sure your background is great. Plan ahead of time and create a schedule: being constant is key. If you don’t have the majority of your time available for recording, set up a schedule. Try to record 2-3 at a time then edit them and spread them out. That way you have content for days in a short period of time. Editing: Gaby and Vicky recommended Final Cut Pro, but if iMovie is all you got they say it was an excellent tool too. Practice, practice, practice, and you’ll be an expert in editing in no time. Monetization: The girls have done a couple of sponsored videos, but the bigger your audience is the better it is for monetization purposes. So focus on growing your YouTube community and everything will fall into place. Title Creation is an art: an art you should definitely master. The tile is the attention grabber and it is important that the titles of your videos grab the attention of as many YouTube users as possible. Using Music in videos: by now the majority of you know that using copyrighted content is not supported by YouTube so putting that awesome Beyonce track as a background tune in a no-go. The girls recommended using royalty free music and touched base on the YouTube’s music library. Collaboration is key: the best way to grow your audience is collaboration. We know that as bloggers, but for YouTube the rule applies too. Reach out to YouTubers you like and pitch them a collaboration idea, or create a funny challenge with your blogger bestie. The trick is to record two videos and for each one of you to publish one on your channels. Then cross-promote the videos and voila! The girls talked about everything basically, but the most important tip they gave to our bloggers was to be authentic and be yourself on camera and have fun while recording.